Not only is it one of the absolute best hotels on Long Island, but The Garden City Hotel is also the area’s premier destination for holiday celebrations. And this Easter Sunday is no different. In fact, on Sunday, April 21, they will be hosting a huge Easter brunch, with seatings at either 11 a.m. or 2 p.m.
All of this can be yours for $111 per person, or $140 for the all-inclusive package. If this sounds like the brunch for you, grab your finest pastels and make a reservation today! Housed in the former Farmingdale Public Library, the Library Café entices guests to enjoy “storybooks” of American fare and cocktails with a sophisticated yet casual atmosphere and an approachable pub menu. Therefore, what better place to celebrate Easter brunch? On Sunday, April 21, from 10 a.m. to 2 p.m., the Library Café will be serving all kinds of classic brunch favorites like Texas Style French Toast, Scrambled Eggs, Buttermilk Pancakes and so much more. All of this can be yours for $27 for adults and $12 for kids. Not to mention, the regular menu will also be available for the occasion. Before Easter arrives, families across Long Island will be taking their children to meet the Easter Bunny at places like The Milleridge Inn in Jericho. 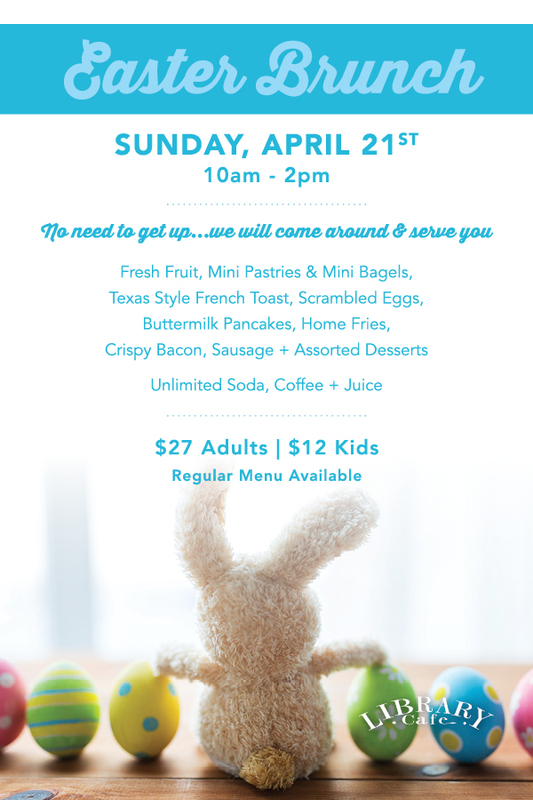 On Saturday, April 20, The Milleridge Inn’s Cottage will be hosting a family-friendly Easter Bunny brunch. Not only will the bunny be around for pictures, but there will also be tons of fun crafts and activities to enjoy during your meal. The price of admission is $39.95 for adults and $24.96 for kids between ages three and 12. Children under two get in free. Although reservations are required for this event, there will be plenty of seatings available every half hour. Easter brunch is an awesome occasion to spend time with friends and family, honoring the reason for the holiday!